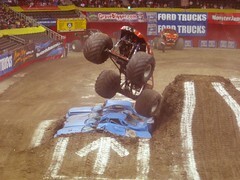 We jumped at the chance to see the trucks at Monster Jam at the Sprint Center here in Kansas City. It was a fantastic event, not only with huge monster trucks but also quad bikes and motorbikes. It certainly wasn't for the feint hearted, these things are VERY noisy, adrenaline pumping machines. Well worth the visit, and a great day out!